"Equivocator, Explorer, Experimenter, Exploiter, Extender—Chapter 12 might be well served as mandatory reading for all subject matter experts! SPARC is not a valuation, per se, but rather a separate consulting engagement that might interest a client—especially if that client is preparing for a sale or planning an exit strategy. Miller has taken the good ideas from five disciplines and married them with value enhancement, creating what could become a very good 'add-on' consulting engagement. NACVA recommends, and looks forward to, further dialogue related to this new approach. This book will open your eyes to new opportunities." "No one illuminates the murky intersection where business strategy and private company value creation meet better than Warren Miller. Now he's focused his extensive professional training and real-world experience to produce this intellectually rich, yet down-to-earth and fun-to-read road map we can all use. 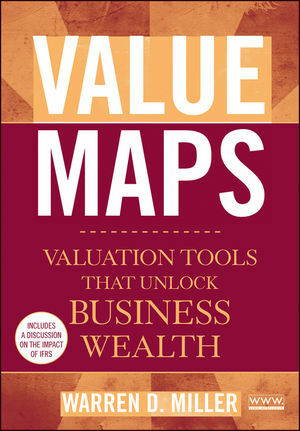 Business owners and leaders, financial analysts, management consultants, wealth managers, CPAs, business brokers, private equity investors, business appraisers—no one should plan to increase the value of an enterprise without Value Maps in their passenger seat." "Private-equity analysts do not often come across scholarly and technical professional reading laced with laugh-out-loud moments! Yet this is exactly what one finds in Value Maps. Warren Miller's advice stems from his career as a finance executive, a CPA, a valuation analyst, and a 'recovering academic.' With pitch-perfect balance, Warren has created both a must-have professional reference guide and a best-practices road map designed to enhance the profitability of your client's business and your own—all in a very readable style with just a 'spoon-full of sugar.' Enjoy the read!" "Extremely readable, with numerous real-world examples—valuation specialists who don't read this book will soon be looking for a new profession. Miller takes the term 'valuation' to new levels, suggesting that appraisers can indeed add real value to their clients' businesses. Clients should demand that a valuation professional read this book before he or she will be hired." —Alfred M. King, Vice Chairman, Marshall & Stevens, Inc.
WARREN D. MILLER, CFA, ASA, CPA, is a cofounder of Beckmill Research LLC, a firm that specializes in valuations, mergers and acquisitions, strategy, litigation support, exit planning, and statistics-driven research. He has taught CPAs and other professionals in thirty states, Puerto Rico, and Canada. His work has been published in Harvard Business Review, Business Valuation Review, CFA Magazine, Strategic Finance, CPA Expert, Value Examiner, and American Fly Fisher. He and his wife, Beckmill cofounder Dorothy Beckert, live in Virginia's breathtaking Shenandoah Valley.